Infusion therapy is an effective way to administer fluid or medication treatment in emergency situation, and for patients unable to take medications orally. The most common reasons for IV therapy include: fluids and electrolytes replacement and balance maintenance; administration of medications, blood or blood products; delivery of nutrients and nutritional supplements. Infusion therapy is challenging area of medicine due to the need for heightened safety, specialization of infusion procedures and the introduction of new drugs with complex handling protocols and stability issues. The features of the container have been demonstrated to play a crucial role in fulfilling these requirements while reducing patients’ infections. Fresenius Kabi, leader in infusion and nutrition therapy, is one of the largest and most capable manufacturers of IV bags in the world. In response to the increasing market demand, Fresenius Kabi Contract Manufacturing offers outsourcing of sterile filling in freeflex® and freeflex®+ bags in many manufacturing sites globally. Freeflex® bags are made of inert plastic material – free of PVC, plasticizers, adhesives and latex. They meet the highest ecological and drug compatibility standards, and also are highly transparent, flexible, and lightweight. They have two separate ports for injection and infusion, with color-coded, tamper-proof break-off closures. 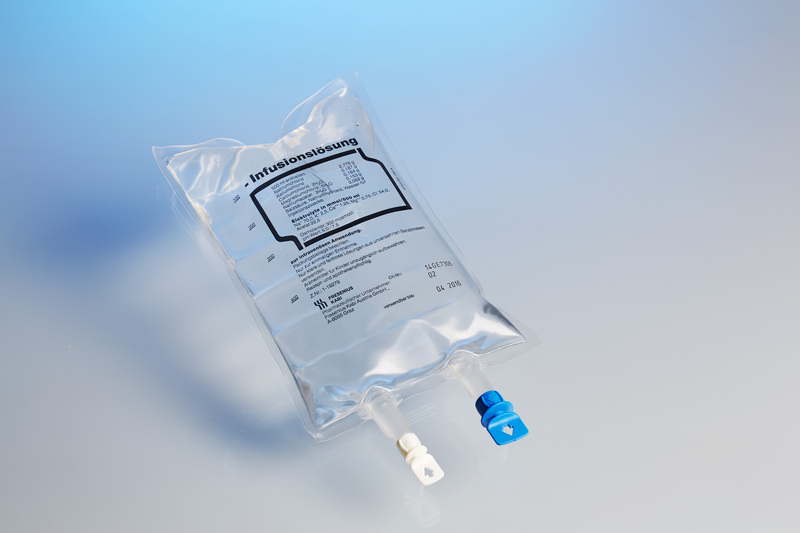 Freeflex® bags are compatible with all commercially available standard IV infusion / transfer sets. Freeflex® bags are manufactured and filled with IV solutions in a highly automated in-line process, in the sizes 250 ml, 500 ml and 1000 ml. They can be sterilized in their overwraps at 121°C. Fresenius Kabi is a specialist in diluent solutions and smart systems for use in hospitals, and provides an effective and convenient solution to this problem. Fresenius Kabi has developed a needle-free system for adding the solvent to the vial with a luer-lock adapter for syringes without needle, and the same luer-lock system can be found on Fresenius Kabi’s freeflex®+ bags. This means that the hospital staff can perform the complete dissolution procedure without a needle – significantly reducing the risk of injuries and leading to a less stressful working environment. The freeflex®+ system is available with a variety of different bag sizes (from 50 ml up to 1000 ml) and different infusion solutions. A huge number of different drug products have been proven safe to use with the bag material and the port system. If you have a product that has to be stored as a powder and are looking for a safe and convenient dissolution system, please contact us at Fresenius Kabi Contract Manufacturing.